If you are looking for a healthy food recipe for babies, here is an easy baby food item that can be quickly prepare at home with very few ingredients. 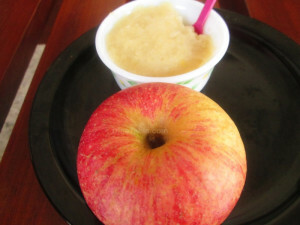 Apple Puree is delicious and at the same time it is highly packed with nutrients that is very essential for the little ones. Consuming Apple is good for the body to keep healthy and strong. Apple conatains Vitamins, protein, carbohydrates, iron, calcium etc. It is good for the health of brain, protects from heart diseases, stroke, diabetes, cancer and more. Clean the apples with water. Peel and core apples. Slice them into small pieces. Take a pan then add sliced apples with water. Allow it to a boil in a low heat until apples become very tender. Take a blender then add cooked apples and blend the apples. This will give you a smooth puree. Tasty Apple puree is ready.